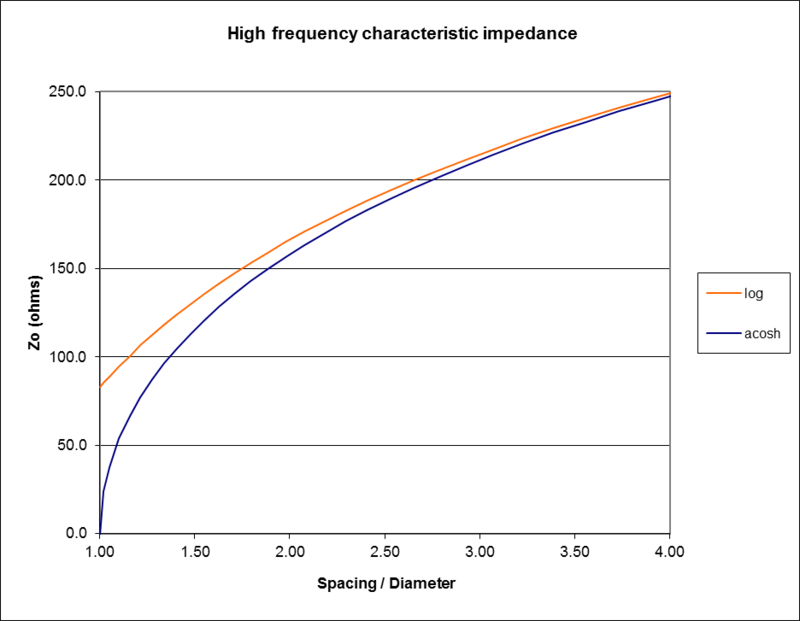 So how did our poster find dimensions for wires for Zo=50Ω when the log graph above shows that as the wire centre to centre spacing approaches the wire diameter, it the wires approach touching, Zo approaches 83Ω? Easy, he specified a centre to centre spacing less than the wire diameter, ie the wires were not just touching but significantly shared the same volume… and the silly calculator came up with 50Ω. Based on measurement experience and (Duffy 2011, Duffy 2001), a pair of 1.6mm diameter wires with 0.05mm enamel (ie heavy build) spaced 1.7mm (ie in contact) should have Zo around 35Ω… but you are unlikely to achieve that spacing consistently when winding onto a ferrite toroid. In this day of computing, calculating the acosh function is not difficult and it is simply slackness that leads to a calculator that isn’t accurate below about Zo=200Ω, it is just a trap for the gullible. ———. 2011. 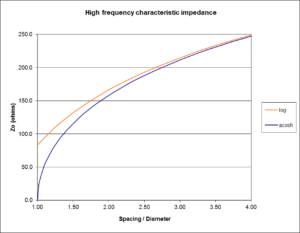 Estimating parameters of two wire transmission lines. VK1OD.net (offline).